The term “Ancient Planter” is applied to those persons who arrived in Virginia before 1616, remained for a period of three years, and paid their passage. They received the first patents of land in the new world as authorized by Sir Thomas Dale in 1618 for their personal adventure. Order of Descendants of Ancient Planters is an incorporated non-profit society whose purpose is to honor and perpetuate the memory of the Ancient Planters; to promote historical and genealogical research; to inspire patriotism, and to enhance fellowship among those of similar interests. 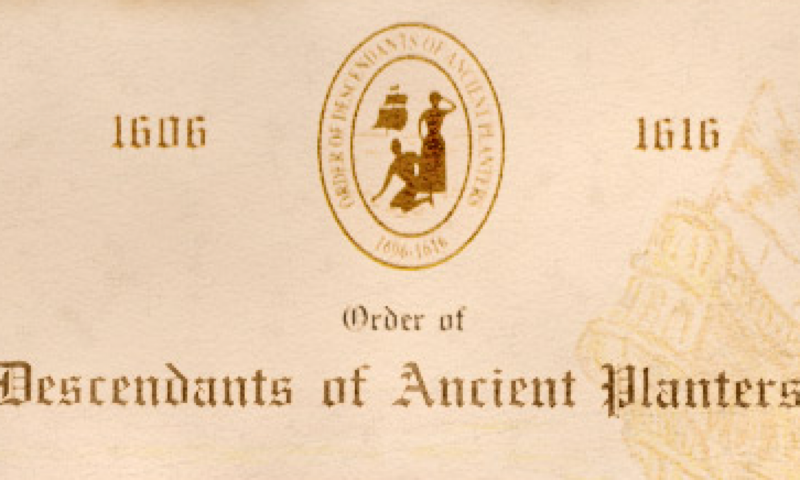 The Order of Descendants of Ancient Planters was founded October 13, 1991, in Raleigh, North Carolina. Membership is limited to descendants of Ancient Planters. Persons unknown to members of the Society may submit the name of their ancestor with a letter of endorsement. An invitation may then be issued. An invitation is valid for one year from the date it is issued. Persons under the age of 21 may become Junior Members upon the approval of application papers and payment of application fee. They pay no yearly dues.